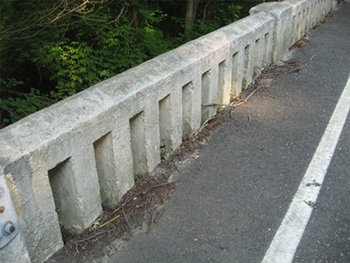 Telegraph Road (CR 540) over Deep Run, Alloway Township, Salem County, NJ – The existing single span structure was constructed in 1923 and consisted of reinforced concrete tee beams and concrete balustrade railings. 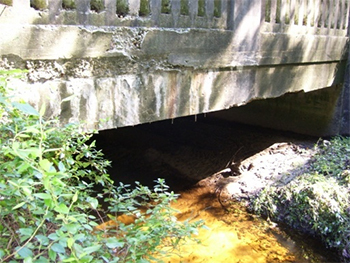 As noted in bridge inspection reports, the structure was considered to be in poor condition due to large spalled areas in the structural tee beams, and up to 100% section loss of exposed rusted rebar in the beams. The project included surveying, preliminary design, final design, permitting, and bid documents for the bridge replacement, as well as construction management and inspection. Considerations, studies, and design included wetlands, flood hazard area, riparian zone buffer, threatened and endangered species, Category-1 waters, warm water fisheries, stormwater management, soil erosion and sediment control.